Since moving to London I have found it frustrating when having to change from the Northern line (coming from the North) onto the Circle/Met/Hammersmith & City lines. As you can see from the image below I am required to take the Bank branch of the Northern line to King's Cross to be able to change; if I am travelling west on the C/M/H&C lines then I have to cut back on myself. The Charing Cross branch of the Northern Line crosses over the C/M/H&C lines but there is no way of changing lines. Euston station is a 5 minute walk from Euston Square station. 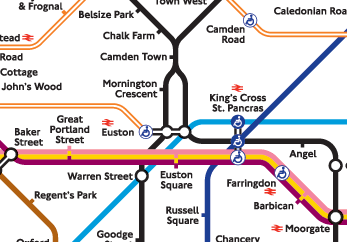 How come the stations are not connected allowing a person to switch to the C/M/H&C lines without needing to exit and re-enter the underground system, which would almost certainly result in a more expensive journey. Warren Street station is even closer to Euston Square station than Euston is. A connection between Warren Street and Euston Square stations would surely be quite simple, or even just being able to switch onto the C/M/H&C lines at Warren Street station itself. Does anyone have any explanation as to why the said links/connections do not exist? In the 19th century, incoming trains to Euston Station from Birmingham had their engines detached in Camden Town and were pulled into a large storage area underneath the station, more to the point, underneath Euston Road. Trains to Birmingham were assembled there and pulled up into the station by rope. The Warren Street tube station was a latecomer, arriving in the 20th century, but the storage area was still being used as a turn-around facility for incoming trains. So there was no place to situate a passenger tunnel without having to go too deep or too far around. If you have ever taken the #1 train in Manhattan to the Battery and rode while it turned around, it is similar to that in appearance except there is no facility for a train to turn around under its own power. British Rail ran a public consultation about station refurbishments in the early 1960's, and the 'public' wanted a car park built underneath the station more than anything else. When HM reopened Euston Station in 1968, parts of the original storage area were still there but unused. Trains running in and out of Euston are bidirectional in the modern era so its ongoing value is dubious. The last time the general public had any awareness at all of that area underneath Euston Road was in the aftermath of the 7/7 attacks when it was used as a repair point. Since Euston Station was the first London rail station to serve as a terminal point for a national rail line, they learned from this 'mistake' and main line stations in Central London that followed used a different strategy to deal with arriving trains. That's why you observe the anomaly at Euston, but not at other stations that were built later. If you want to take up advocacy for having a tunnel built, the relevant consumer lobby is Transport Focus. Gagravarr pointed out that the Crossrail2 project may hold possibilities, but it's also reasonable to expect relentless and unyielding opposition from the Bloomsbury Ward. Our view is that this site is not suitable for a station entrance and we are concerned about any machinery or ventilation equipment that may be installed here as it could cause a noise nuisance. We are also concerned that any future works could cause a noise nuisance. It should be noted that local residents have had to endure the noise from Crossrail works as well as the redevelopment of the opportunity area around Tottenham Court Road Station. Until then, they have a simple workaround: an outerchange / out-of-station interchange. As detailed in the allowed out-of-station interchange list, from Euston Square, you can have a free transfer by going outside + walking + in again to Euston station. Walking outside is probably actually quicker than a badly-placed tunnel, so unless it's raining, it actually works fairly well for a free option! Not the answer you're looking for? Browse other questions tagged london london-underground tfl or ask your own question.